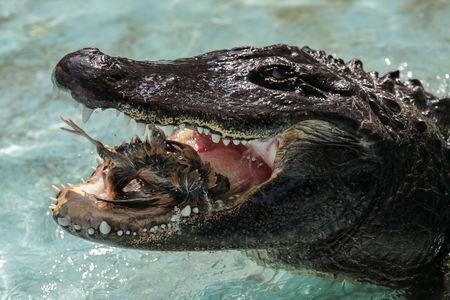 BELGRADE (Reuters) - American alligator Muja arrived at Belgrade Zoo on the eve of the Second World War and is believed to be the oldest of his kind in captivity, and still in good health with a hearty appetite for his age, his handlers said on Tuesday. Generations of Belgraders and tourists have come to watch Muja, and though he rarely moves around much, he is still agile at feeding time - when he munches on rats and quails. This is when his age shows, though, as he sometimes misses the target when he snaps at his food. So far Muja's only health issue has been gangrene, which led to him having his front right claw amputated in 2012. "He is well ... and healthy, eats well and is in good form for his age, so we hope that he'll remain that way for many years," zoo director Srboljub Aleksic said. Muja arrived from Germany in August 1937. An old newspaper clipping about his arrival at the zoo said that he was two years old at the time, putting him in his early 80s today. He survived two carpet bombings of the Serbian capital - one by Germany in 1941 and the other by the Allies in 1944 - when all the official documentation about his transfer was lost. Susan: Our Congress needs to issue subpoenas to Deutsche Bank regarding the following: "James' office also declined to comment on the status of the documents regarding financing for the Trump Organization, the holding company that has been run by Trump's sons Eric and Donald Trump Jr since he entered the White House. New York authorities also wanted records related to the Trump Organization's failed attempt in 2014 to buy the Buffalo Bills football team, the source said on condition of anonymity."